The challenges addressed in this project are multidisciplinary in nature and involve the combined talents of Europe’s NMIs, academic labs and the industrial partners. This consortium brings together four European NMIs (LNE, NPL, PTB, METAS), which have broad experience and expertise in the complementary areas needed to ensure the success of this project and it also involves 3 external partners (CEA, FhG and IMEC) and 1 unfunded industrial partner (Fogale). LNE will bring expertise in electrical metrology, traceable nanoscale (SMM) and macroscale electrical transport measurement (RF and microwave) and modelling applied to TSVs interconnects. LNE will coordinate the project and will ensure the knowledge transfer and exploitation activities have the maximum impact for the project. NPL will bring expertise in Scanning Electrical Microscopy (spreading resistance and current), scanning thermal microscopy and thermoelectric transport measurement and modelling in nanomaterials. NPL leads the impact WP where their experience has been proven in previous EMRP projects. NPL has a wide portfolio of characterisation instruments and services, including world-renewed expertise in Electron Microscopy, Optical Microscopy, and Scanning Probe Microscopy. They have a long expertise in the thermal and electrical characterisation of transport in semiconductor nanostructures. PTB will bring expertise in dimensional metrology based AFM and SEM with the lowest measurement uncertainties. PTB also has an extensive experience in the field of metrology using synchrotron radiation. The radiation sources and calibrated instrumentation in PTB’s laboratory at BESSY enables the application of the reference-free X-ray spectrometry methodology. PTB’s X-ray spectrometry group has relevant expertise in the field of the determination of fundamental parameters with reduced relative uncertainties due to its instrumentation which has been purposely built. CEA will bring expertise in new physico-chemical characterisation techniques for micro/nanotechnology, and nanomaterials. The project will benefit from the CEA’s nanocharacterisation platform (PFNC) which is unique in Europe. CEA has worked in 3D integration for several years, and it is a worldwide leader in process development for this technology. FhG will bring expertise in High Density interconnects fabrication and 3D heterogeneous Integration. FhG has expertise in wafer to wafer bonding, wafer level packaging, chip sized package development, and advanced die bonding. IMEC will bring expertise in 3D processing and related metrology and reliability needs. IMEC has expertise in various 3D-metrology tools (ex. scanning acoustic microscopy, Raman spectroscopy, IR scanning laser microscopy, interference based optical techniques, AFM based techniques, etc.) and in electrical and environmental reliability tests of TSVs and 3D technology. Fogale will bring expertise in non-contact metrology for device characterisation and in process control of high aspect ratio TSVs for 3D integration. Fogale has long experience in advanced 3D dimensional metrology solutions with a high level of expertise in optical metrology. Fogale nanotech provides standard and customised systems which are well suited to new metrology requirements for semiconductor applications. METAS will bring expertise in Scanning Microwave Microscopy (SMM) and microwave measurements applied to nanomaterials. METAS will particularly focus on measurement through a VNA (vector network analyser) which is an important part of a SMM system and where they have gained a long experience into effects that affect S-parameter measurements. 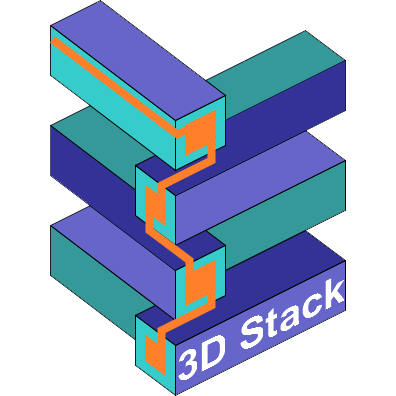 The project includes a team with different, yet complementary, expertise, to focus on specific aspects in 3D heterogeneous integration development. Moreover, different partners will make comparative measurements, to establish the accuracy of metrological tools and methodologies. The work is divided among the partners such that the specific experience of each partner is fully exploited. All partners have significant experience of internationally challenging research projects within the FP7 and EMRP programmes. The project management will be overseen by the coordinator Djamel Allal from LNE. He has vast experience in key research activities and has successfully managed and delivered research and metrology projects for more than 15 years. This experience will greatly help to manage this project and the partners involved.